Since having the honor of becoming the IAM’s 14th International President in January, I’ve been taking stock of where the IAM is and where our members want us to go. The message is clear: Organize like our livelihoods depend on it, because they do. From the low-wage bastions of the South to Uber drivers seeking a fair shake in New York City, the IAM is responding to the calls of thousands of working Americans who want, and deserve, a voice on the job. We’re shifting the IAM’s resources toward organizing efforts that will make their American Dream a reality, and we won’t be intimidated by corporations or politicians who say we can’t. When we organize new members, we gain the resources necessary to better represent our current members. That means more power at the negotiating table and a better way of life for you and your family. I encourage you to think how you can contribute as you look through this IAM Journal 2015-2016 Year in Review. You’ll see what a diverse and dynamic union the IAM has become, the wealth of opportunities our members have to get involved and the challenges we face as the IAM charges into its 128th year of fighting for working families. In 2015, we organized new workers in new ways, expanded educational opportunities at the Winpisinger Education and Technology Center took our power in numbers to legislatures across North America, and much more. We’re also looking ahead to a busy 2016 that will include the IAM Grand Lodge Convention in Chicago, where you – the membership – will chart the course of this great union for the next four years. I trust we’ll make the necessary decisions to continue our commitment to fighting for every IAM member while also expanding our organization for the benefit of all of us. As one of the largest industrial trade unions in North America, the IAM has worldwide influence. To stay that way, all of us need to be engaged. When we realize we all have the ability to grow this great union, there’s nothing we can’t accomplish.-labor candidates get elected, to help run our local lodges, we can ensure we will be leaving the IAM in as good shape as those before left it for us. 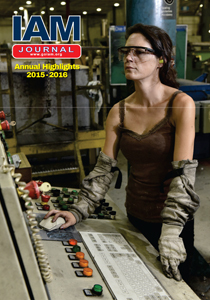 The post IAM Journal – 2015 Year End Review appeared first on IAMAW .